As an Australian Shepherd owner, how can you help to keep your dog’s coat looking its best? It will no doubt be with the best brush for Australian Shepherds. While his fur is only one of many things to love about this breed, keeping your dog in tip-top shade is quite important. And this breed in particular is known for turning heads. Do Australian Shepherds Need Brushing? Australian Shepherds require regular brushing to keep their thick, double-layer coats healthy and thriving. They also need regular brushing to help you assess their skin for anything unusual such as bumps, scrapes or cuts that you may not have noticed during regular petting or play. Although Australian Shepherds need regular brushing, you can’t just go into your cabinet at home and use any old human brush on his unique fur. What Types of Fur Do Australian Shepherds Have? The Aussie dog is a beautiful combination of looks, brains and work ethic. His gorgeous coat consists of two layers, which help to provide both insulation from extreme climates and protection from water and debris. The outer layer of an Australian Shepherd’s coat is typically moderate in length and can be straight, wavy or even have a slight curl. His outer coat is not as harsh as some other double-layer breeds, such as the Husky. But it’s not soft to the touch. Coolest of all, this outer coat is water resistant. The undercoat of the Aussie is dense and woolly. It provides insulation and helps protect the Aussie from extreme heat and frigid cold weather. While a number of sites and even some groomers boast certain “Aussie haircuts,” Aussie don’t need haircuts. Their coats are perfectly suited to keep them warm in the winter and cool in the summer. The only real maintenance this breed needs is occasional bathing and regular brushing to ensure excess hair is kept under control and matting doesn’t occur in their moderately long fur. How Often Should You Brush an Australian Shepherds? Brushing your Aussie regularly is an important part of keeping his coat and skin healthy. Some owners opt to brush their Aussies once a day, giving them a quick once-over with a pin or slicker brush to ensure their coats are tangle free. They may help to get rid of loose hairs that would normally end up on furniture and clothing. Others feel that their Aussies only need to be brushed once a week. The amount of brushing you will give your Aussie depends on his coat, how often he sheds, and shedding season during the spring and fall. During shedding season, your Aussie sheds heavier than usual and requires more regular brushing to keep all that dead hair under control. It is important to note that an Australian Shepherd’s hair is prone to breaking if brushed too often while dry. Many groomers recommend using a high-quality, dog-friendly, leave-in conditioning spray that can be brushed out. This spray keeps your Australian Shepherd’s coat healthy and helps stop any breakage during the brushing process. It should also leave him smelling fresh and clean between bath time. Now, let’s go over some of our favorite brushes for the Australian Shepherd. Since a pin brush is one of the brushes you might be utilizing daily for your Australian Shepherd’s unique, double-layer coat, we suggest the Safari Pin & Bristle Brush for Dogs. This brush is excellent for medium-size breeds such as the Aussie. It’s also great for helping to promote natural oil production in the skin to help keep your Australian Shepherd’s fur healthy and shiny. The brush also helps to remove debris, dirt and dead hair. Another brush you need to use quite often is a slicker brush, such as the Self Cleaning Slicker Brush by Hertzko. We love this brush because it’s great for the Australian Shepherd, who is prone to matting. This particular grooming utensil reduces loose hair, and relieves tangles painlessly and easily. The fine, bent wires of the slicker brush are designed to reduce pulling or scratching during the brushing process. The easy eject button makes cleanup a breeze. The slicker brush helps remove dead hair, dirt and debris. And since Australian Shepherds are active breeds, they can be prone to matting. For the Aussie who is especially prone to coming home with tangles in his beautiful fur, we recommend the RUBOLD Dematting Tool for Dogs. The RUBOLD Dematting tool is a rake comb that is best suited for penetrating your Australian Shepherd’s outer layer to get into his undercoat, where sneaky dead hairs hide and cause tangles, matting, and odor. This brush’s uniquely shaped prongs reduce scratching and pulling, making the raking process painless and even enjoyable for your Aussie. Another dematting tool we love for Aussies is this Double-Sided Professional Grooming Rake by GoPets. Great for a number of different levels of mats and tangles, this is your go-to rake brush for reducing knots and getting rid of dead hair. The double-sided brush means it can be used for a number of purposes, offering different sizes of teeth on each side for any mat you may encounter on your Australian Shepherd. This is also an excellent de-shedding tool to use during shedding season as well. And last but not least we can’t leave out Andis Pet Steel Comb. This is a favorite tool amongst groomers and Aussie lovers. It helps to gently remove mats, tangles and debris while also leaving a beautiful shine and fullness to your Australian Shepherd’s coat. The comb also helps to stimulate the skin and hair follicles for optimum growth, shine and health. Now that we know which brushes to use on your Australian Shepherd dog and why, let’s talk about how to go about using them. Most experts recommend acclimating your Aussie to brushing at an early age. Utilize lots of treats and praise to help him associate the process with something positive and build a bond. Using a leave-in conditioning spray for your Aussie during regular brushing is important to reduce damaged hair and breakage. We suggest investing in a high-quality dog detangling spray such as the FURminator detangling Waterless Spray. For the most part, as long as you maintain your Australian Shepherd’s coat and brush him consistently each week, his coat should take no more than five to 10 minutes to brush out. A pin brush and slicker brush can be used for everyday use. The rake brush can be used during shedding season. Routine de-shedding maintenance can be completed once a week or even more if necessary. Pay special attention to your Australian Shepherd’s hindquarters, lower legs, tail and under his belly. This is where his hair grows longest and can be most prone to collecting debris, forming painful mats and tangles. And just as regular brushing can help maintain your Australian Shepherd’s beautiful coat, neglecting regular brushing can lead to seriously damaged fur and skin. If left unattended, a damaged Aussie coat can take up to a year to repair so stay on top of it. If you are interested in watching a video on the upkeep of an Australian Shepherd, click here. 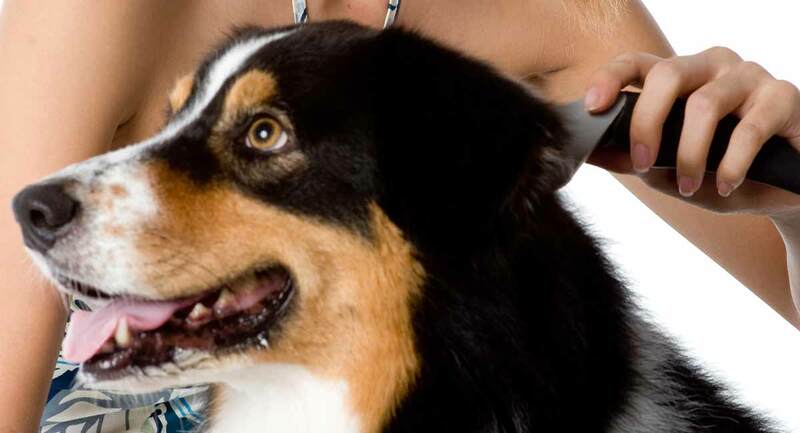 Between professional grooming sessions and bath time, you should prepare to brush your Aussie at a minimum once a week. However, many owners opt to brush their Australian Shepherd everyday. Brushing regularly should take somewhere between five to ten minutes, so long as your Aussie’s coat is healthy and maintained. Keep in mind that, aside from routine trimming around your Australian Shepherd’s legs, he does not typically need a haircut. His double-layer coat is perfectly capable of keeping him warm in the winter and cool in the summer. Using a high-quality, leave-in spray during brushing sessions, as well as utilizing the proper brushing tools, will help to maintain your Australian Shepherd’s beautiful coat for years to come.